We are continuing our series of tests of different display solutions for the Raspberry Pi 3. Today, I propose to test the LCD 3.5 ” HDMI touch screen delivered with a clear acrylic case. The touch part is managed via the GPIO of Raspberry Pi. This solution will be reserved for projects that do not use the GPIO of Raspberry Pi. It is a small box very practical to protect the Raspberry Pi. The kit consists of a LCD 3.5 ” from the Chinese company Kedei capable of displaying a resolution ranging from 480×320 pixels to 1920 * 1080 pixels (it will be necessary to think of buying loupes at the same time :-D). We often find this kit on sale for less than €20 on AliExpress. Here we will test it in the basic resolution (480×320 pixels). Equivalent kits are available under the Geekwrom or Kuman brand. The touch part is managed by the GPIO of the Raspberry Pi. 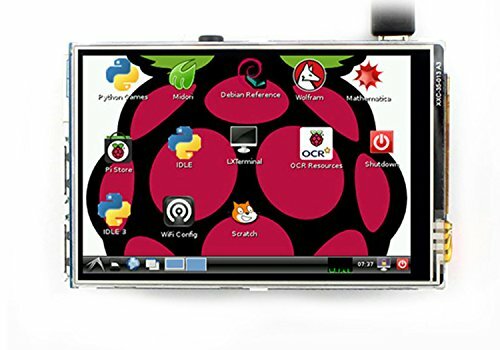 The screen is designed as a HAT compatible with the GPIO of Raspberry Pi (2 or 3). If you want to keep access to the GPIO for your projects, you will have to do the wiring of the touch part yourself and use a standard HDMI cable. Alternatively, you can also opt for a screen with management via the USB port of the touch part. Start by removing the protective film on each element of the case. Next, attach the 4 spacers to the screen frame. Attach the Raspberry Pi 3 to the base of the case by inserting a spacer each time. Connect the LCD display to the GPIO of the Raspberry Pi 3. It fits completely to the right of the GPIO connector. Insert the four sides of the box. 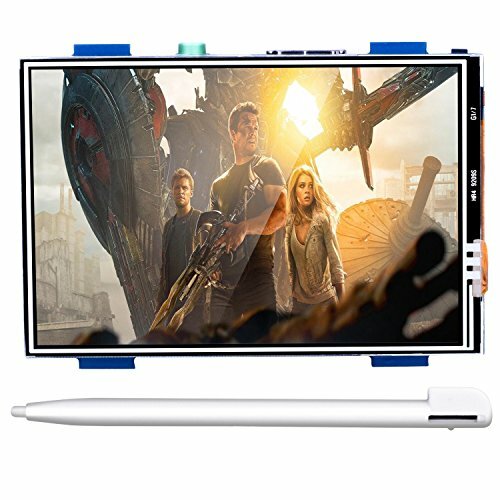 Connect the HDMI screen with the angled connector. Finish the assembly by fixing the base on the four spacers. Before going further, turn on the backlight of the display using the small switch located next to the HDMI connector (above the power connector of the Raspberry Pi). If you have read the article about the Waveshare 7 “LCD test, you will find the same configuration principle. Here, there is (almost) nothing to do because everything is managed by a configuration script. For each screen, we find the driver and an image of the pre-configured Linux distribution. I have not tested the proposed images (it is not necessary). I have no idea of the proposed distribution for the Raspberry Pi. Power on the Raspberry Pi and connect it SSH to it (how to do it). Run the following command to download the driver (modify the link if necessary). As you can see, the /boot/config.txt file will be overwritten by this new version. If you have made any changes to this file, do not forget to make a copy and postpone your settings. The other solution is to comment the sudo cp ./lcd_35_v/config_480_320.txt /boot/config.txt line and manually add the configuration to your current file. If you are ready, run the installation script. The script runs. The Kernel is updated and then Raspbian restarts. raspberrypi-kernel passed in frozen ("hold"). raspberrypi-bootloader passed in frozen ("hold"). You can change the display resolution in the config.txt file. Below a resolution of 800×600 pixels, it is often difficult to access or confirmation buttons. The system must be restarted after each modification to take into account the new display parameters. Here is the result in 1024×768 pixels. Obviously, it is a screen too small to develop or surf the internet. The advantage of being able to have a high resolution is still interesting if you connect remotely to the Raspberry via a VNC connection. VNC does not know (can not) display a higher resolution than the screen. In the next tutorial, we will see how to install Retropie to turn this little box into a retro game console.